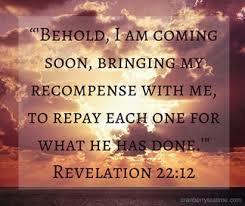 Scripture: Revelations 22: 12 “Behold, I am coming soon! My reward is with me, and I will give to everyone according to what he has done. Observation: What will I have accomplished when my time to meet Jesus comes? Will I still be sitting on the couch thinking of all the things I should be doing or or will I be doing them? Will my life represent service, obedience, praise and glory to God or a self centered, do what I want to do life? God is not silent in my life, but at times I chose not to listen. Application: God has made it clear what He wants of me with small groups, lay counseling and using my gift of food management for the church. To use my testimony of depression and how God raised me up from that. Prayer: Dear Lord I deserve no reward, but You deserve my all. May I present this life as a living sacrifice to you and my reward to know that I pleased You.